In March 2017 social movements in El Salvador achieved a major victory - the approval of a complete ban on all metal mining in the country, the first country in the world to do so. This momentous socio-environmental struggle shows us that the powerful don't always win, and that it's possible to win against the strategies of corporations hell bent on expanding their destructive extractive projects. It leaves us with many important lessons for other similar struggles in Latin America and around the word. 2017 saw the people of El Salvador achieve one of the most important socio-environmental victories in recent decades in Latin America. Social movements in the tiny Central American nation lead a successful struggle for a complete nationwide ban on all metal mining in the country. The law was passed by the legislative assembly on the 30th March this year, just six months after a World Bank Tribunal ruled in El Salvador’s favour in an international arbitration case brought by a Canadian mining corporation. The historic struggle holds valuable lessons for movements all over the world that are similarly fighting to protect their water and environment from the corporate-driven extractive projects. It would be impossible to summarize over a decade of experiences, and the analysis they have informed. Nevertheless, we wanted to do our part in documenting this important legacy and sharing some of the lessons learned from the struggle by interviewing five people involved in the campaigns at both national and international levels. Our interviewees were Vidalina Morales from the Economic and Social Development Association of Santa Marta (ADES); Pedro Cabezas from Association for the Development of El Salvador, (CRIPDES) and Saul Baños from the Foundation for the Study of the Application of the Law (FESPAD); Manuel Pérez-Rocha from the Institute of Policy Studies in Washington DC; and Jen Moore from Mining Watch Canada. They spoke to us about the strategies used by the Pacific Rim mining corporation for over a decade to get access to the gold of El Salvador, as well as the ways in which the movement confronted these strategies and laid the groundwork for the recent national ban on metal mining. We hope that their experiences and reflections will inform the struggles of defenders elsewhere facing similar threats as they defend their territories from destruction. Historically, El Salvador has not been a mining country. Some mining is practiced, but mostly small-scale artisanal mining, with a very small number of corporate mining projects that have left behind serious environmental destruction and water pollution. The internal armed conflict that rocked El Salvador in the 70s and 80s kept the big mining companies away until the peace accords were signed in the 1990s. It was in the 90s that the government implemented a series of pro-mining regulatory changes. It was into this context that the Canadian corporation Pacific Rim arrived in 2002. Their aim was to extract the gold from a deposit known as ‘El Dorado’ located in the Cabañas region of the Lempa River basin. In response to mining industry activity, local communities began to organise and in 2005 founded the National Roundtable Against Metallic Mining in El Salvador – a coalition of social and community organizations with the objective of protecting the country’s water from mining activity. El Salvador is extremely vulnerable to the effects of climate change. It has experienced severe environmental degradation over the years and at least 90% of its ground water is contaminated. From day one, Pacific Rim (taken over in 2013 by the Canadian-Australian corporation Oceana Gold) set about implementing a series of classic, carefully calculated corporate strategies – strategies that the movement in El Salvador had to fend off for over a decade. Vidalina Morales giving a press conference with other members of the National Roundtable against Metal Mining in El Salvador. 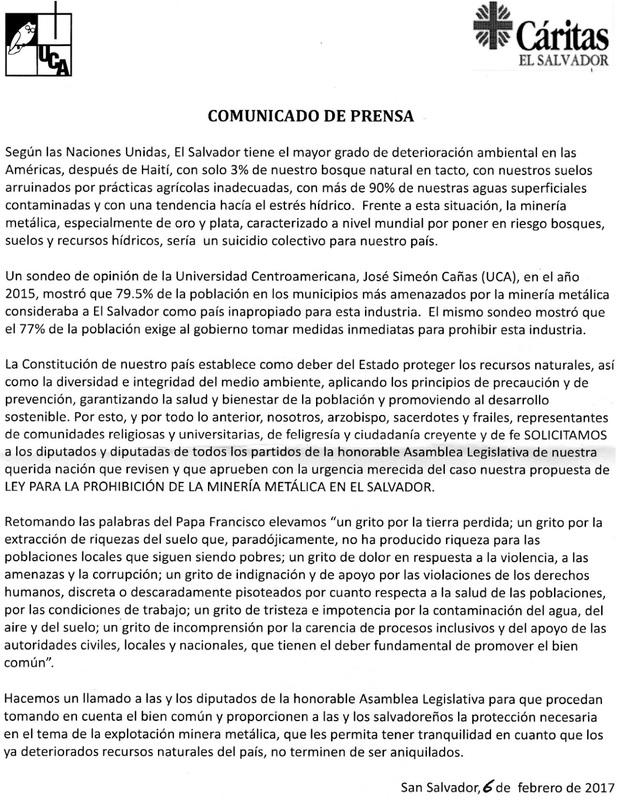 Source: National Roundtable against Metal Mining in El Salvador. These strategies can be divided in to two categories. One is more ‘persuasive’ in character – the carrot in the classic carrot-stick combination. It includes the creation of a foundation to carry out philanthropic activities in its name to win the community over. It also includes some of the more traditional lobbying strategies aimed at winning support in the political system. The second category is more ‘coercive’ in character – the stick hanging over your head. It includes attempts by the corporation to divide local communities causing serious social tensions, including increased risks and threats to the safety of environmental activists. It also includes the multimillion dollar legal case that Pacific Rim brought against El Salvador in 2009 at the Center for the Settlement of Investment Disputes (ICSID) (at the World Bank) after the government had denied the company permits to exploit ‘El Dorado’. Below we will show how the company applied these strategies, the response by the affected communities, and what happened in the international solidarity campaign. The creation of philanthropic foundations by corporations is an old strategy that allows corporations to insert themselves into local dynamics and win the confidence of the local population. In 2005, now certain of the existence of gold in El Salvador, Pacific Rim set up the El Dorado Foundation in the Cabañas region. Presented as part of its corporate social responsibility, the foundation became the public face of the company and the main promoter of its interests. They rolled out a range of health and education projects, capacity building with women’s groups, infrastructure projects etc. This allowed them to present themselves to the communities as a benign benefactor of ‘development’. The foundation had even made a number of donations and sponsored local football teams and festivals, establishing themselves at the heart of some intimate local community spaces. For Saul Baños, it’s clear that the foundation has acted as the social arm of the company, taking advantage of the needs of local people in order to recruit people sympathetic to mining. “We must remember that Cabañas, according to the poverty map, is one of the poorest of El Salvador’s 14 regions….so the company, using the El Dorado Foundation, found a sector of the population in great need,” he said. For years, communities and allied organizations have denounced the way the Foundation has exploited the needs of the people as a tool to win support for their mining project. This has indeed damaged the social fabric, and, as experts have outlined, sewn seeds of violence that over the years would erupt with tragic consequences. On top of their promises of investment and increased revenue, Pacific Rim also promised jobs to people to win their support, generating false expectations in the population. The company had even promoted a potential recruitment list. What the company didn’t say was that large-scale mining projects are highly mechanised operations in which local labour usually fills the worst paid jobs in working conditions much worse than some of the highly specialised jobs. Inevitably this doesn’t deliver the promised local development, but rather leaves behind it a legacy of polluted rivers and divided and weakened communities. Jen Moore describes the promises of development and jobs from Pacific Rim/Oceana Gold as “very misleading ”. “They can further heighten local tensions because the company is generating false expectations of jobs in certain groups…and that could cause reprisals against those that are still resisting mining- generating a really toxic general situation”. Saul Baños agrees. “The mining companies, especially the multinationals like Oceana Gold, try to get people in government and the general population to believe that mining is the great saviour for their desperate economic situation, when this is not the case. Mining entrepreneurs here (in El Salvador) have claimed that the mining industry is going to create thousands of jobs –both directly and indirectly….which we have disproved” he says. “Children are the future of San Isidro”, “Values-based work to improve our communities” “Responsible Mining takes care of the environment”. These are some of the slogans that the El Dorado Foundation and Torogoz Minerals (Oceana Gold’s subsidiary in El Salvador) share on their social networks – all part of their PR and communication strategies to open the door to mining in El Salvador. Source: Facebook page of the El Dorado Foundation. According to Pedro Cabezas, this campaign intensified after October 2016. That was the date when the ICSID tribunal (see below) ruled against the company in its case against El Salvador – denying them the multi-million dollar pay-out they were claiming from the government for refusing them exploitation permits for “El Dorado”. After this, affirms Cabezas, “the company hired a PR firm to create a ‘Responsible Mining’ campaign, a concept that was thereafter widely used by the company in all of its communications. The strategy meant buying up more space in the media, newspapers, magazines etc, all destined to seek social and political support. Logo of the El Dorado Foundation created by Pacific Rim. Source: Facebook page of the El Dorado Foundation. In the opinion of Jen Moore, the more fundamental problem was that this new ‘Responsible Mining’ campaign being pushed by the company could generate new tensions locally by “re-establishing hopes among economic and political actors that might have been interested in reviving the mining project, and that it cold even create the conditions for increased violence”. Lobbying is one of the most common practices used by corporations to achieve political support for their projects. According to Moore, Pacific Rim used its philanthropic face very well to this end. “They played politics by trying to forge new relationships and carry out social activities with local mayors that supported mining in Cabañas, even without the approval of the regional and national administrations, who were generally against mining.,”. The company also attempted to intervene directly with the government – mainly after the mining moratorium was implemented by the Salvadoran government in 2008 (as a result of social pressure). They even tried to convince the authorities to change the Mining Law, and went so far as to draw up their own draft law and attempted (unsuccessfully) to get the Legislative Assembly to approve it. In the words of Saul Baños, “the public officials of the day have always felt pressure from transnational corporations and their lobby groups as well as the domestic companies interested in developing mining in the country”. In an interview with local media, the state’s lawyer in the ICSID case, Dr. Luis Parada affirmed that “since Oceana Gold bought Pacific Rim in 2013, they have been in close contact with Salvadoran government officials”. For the lawyer, this broke with generally accepted practice in cases of this kind in which, if one of the parties wants to come to a deal, this should be communicated through their lawyers. Parada affirms that towards the end the company even attempted to slow down the ICSID tribunal’s decision (in October 2016) in an attempt to broker a deal with the Salvadoran government. “I heard that the company had been making offers to some officials since before the decision was announced, with the intention of reaching a settlement that would allow them to mine for gold and silver in El Salvador” affirmed Parada. According to him, even if the ICSID ruling doesn’t force them to leave, it would make no sense for them to insist on staying in El Salvador unless they had some hope of being able to deal with high-level officials. As well as being behind these destructive and misleading practices, multinational corporations have historically also found themselves enmeshed in acts of violence and the murders of environmentalists related to their extractive projects. The mining conflict in El Salvador was no different. In this case it was the murders of Marcelo Rivera, Ramiro Rivera Gómez, Dora Recinos Sorto (8-months pregnant at the time), and Juan Francisco Durán. They were all environmental defenders opposed to the mine that were murdered between 2009 and 2011. In a joint declaration to the UN Human Rights Council in 2014, the Institute for Policy Studies (IPS), the Center for International Environmental Law (CIEL) and the Centre Europe-Tiers Monde (CETIM), stated that “the intention of the Pacific Rim Corporation to mine for gold in Cabañas has caused conflicts, deepened social divisions and increased threats and actual violence – that has still not been thoroughly investigated. The upsurge of local opposition to the mine in Cabañas resulted in tensions between community, religious and media organizations and local politicians that were supporting Pacific Rim”. The document quotes the Human Rights Ombudsman who stated at the time that these violent acts “are interrelated”, implying that that they were connected to the environmental defence work of the victims. Despite these arguments, judicial authorities insisted that the causes of the murders were not interrelated. For Saul Baños, we mustn’t forget that the people murdered were from the affected communities and were members of the National Roundtable against Metal Mining. “We have always held the hypothesis that their murders, assassinations, their disappearances were connected to their work in defence of the environment and their struggle against metal mining”, affirms Baños. Meanwhile, the Roundtable continues demanding that the causes of these crimes be investigated, including into those who ordered them. To date, this has still not been done. International arbitration cases are one of the most commonly used corporate strategies to pressure governments to bend to their interests. El Salvador was no exception. In 2009, when they couldn’t get the permits to exploit the “El Dorado” gold deposits – because they didn’t meet the legal requirements – Pacific Rim brought an arbitration case against El Salvador in the World Banks’s ICSID court. The company was seeking compensation of $314 million, later reduced to $250 million. At the same time, the company changed its subsidiary registration from the Cayman Islands to the state of Nevada in the US, to be able to use the protections of the US-Dominican Republic-Central America Free Trade Agreement (DR-CAFTA). They were denied jurisdiction under DR-CAFTA, but ICSID decided to accept the case under the National Investment Laws of El Salvador[i]. El Salvador would later modify its National Investment Law to prevent further cases, but the Pacific Rim case would go ahead. Demonstration outside the World Bank HQ to demand that ICSID give its final verdict in Pacific Rim/Oceana Gold case against El Salvador. Source: National Roundtable against Metal Mining (2016). At the end of a legal battle that lasted over 7 years and a hard fought international campaign, the ICSID tribunal announced its decision in October 2016. It determined that Pacific Rim/Oceana Gold’s case was unfounded and that the Salvadoran state was not obliged to pay the company anything. On the contrary, the company was ordered to pay $8million to the government of El Salvador for their legal fees. Members of the National Roundtable giving a press conference following the ICSID result in October 2014. Source: National Roundtable. After the result of the ICSID case was known, the Roundtable published a press release in which it declared that it was pleased with the result, but that “El Salvador didn’t win anything here”, declaring that the only thing that was decided was that the government didn’t have to pay compensation for applying its own laws. Nevertheless, the ICSID result became international news and it represented an important victory for the member organizations of the Roundtable – with the support of international allies – and for the Salvadoran anti-mining movement in general. When the National Roundtable against Metal Mining was established in 2005, its aim was not only to prevent the ‘El Dorado’ mine from going ahead in El Salvador and to counter the strategies of Pacific Rim, it also sought to ban metal mining outright. And it did. At the end of March 2017, the Salvadoran assembly approved the law to ban all metal mining. It is a public interest law with retroactive effect that will block any requests for the exploration or exploitation of minerals in the country. This great achievement wouldn’t have been possible without the systematic process of building power by local organisations. This included a series of concrete, pro-positive initiatives on their part, but also being able to nimbly adapt to an ever-changing political climate. According to our interviewees, there have been at least five key lessons that we can take from the struggle. Act Early – Don’t Let The Corporation Get A Foothold. Without question one of the main pillars of the Salvadoran anti-mining movement’s victory in El Salvador was that they got organised and took action before the corporation could consolidate its presence on the ground. By creating a space for critical reflection on the impacts of mining, they were able to learn from both the experiences of neighbouring countries, and from their own historical experiences with metal mining. Just like in the rest of Central America, mining company activities in El Salvador have been a constant threat historically. But, as Pedro Cabezas mentioned, the armed conflict in the 70s and 80s scared the mining companies away, only for them to come back once the peace accords had been signed and following the neo-liberal economic liberalisation drive in the 90s. “Later, they prospected all of the mining sites in the North of the country and they found that there were 33 potential mining sites,” says Cabezas. He goes on to say ”the communities in El Salvador were already beginning to ask questions about the impacts of mining in the region and learning about what happened in neighbouring countries, such as at the San Martin mine in Honduras, where, by the end of the 90s, there had already been social and environmental disasters”. To these experiences were added other local mining experiences such as the pollution of the San Sebastian River in the town of Santa Rosa de Lima where a few decades previously the US mining company Commerce Group had operated and left behind serious water pollution. Popular consultations have been used historically in several Latin American countries as mechanisms of direct participation in the decisions that affect people’s lives. In El Salvador, communities used the country’s municipal code that obliges municipal authorities to carry out an informed consultation on issues of local interest, once a request has been made by 40% of locally registered voters. People felt that the government moratorium on mining, in place since 2008 (thanks to the anti-mining movement) was not sufficient and that there was a need to generate legal tools to ensure that this activity was permanently banned. In terms of winning a mining ban, because of such an uncertain political climate at national level the local communities, accompanied by the national movement, chose this strategy of working with local governments and promoting local decision-making mechanisms. In 2014, San José Las Flores in the department of Chalatenango was the first municipality to be declared free of mining after 99% of its inhabitants voted in favour of the mining ban in their territory. The vote got both national and international attention, and over the following years, four more municipalities in Chalatenango and one in Cabañas declared themselves free of mining. Promoting Mining Free Territories. Minería. Source National Roundtable. According to Pedro Cabezas, the objectives of the popular consultation strategy were especially political in nature. They sought to “promote strategic organising in local mining-affected territories; prioritise local leadership in the national struggle; and involve local governments in working for a ban at national level; [they also sought to] generate binding democratic tools for defending the territory within Salvadoran legislation,” he explains. Jen Moore, meanwhile, told us that “the territories free of mining processes have been very important for building a parallel organising and self-determination process from within the different municipalities…and they reflect a much broader tendency at regional level (in Latin America) where we are increasingly seeing mining ban initiatives at community, municipal and regional levels, more than at the level of national governments because of all of the challenges and difficulties that that implies”. In effect, the popular consultation mechanism has been a success in El Salvador in terms of achieving its primary objective but also in terms of generating debate, positioning the issue on the public agenda and building alliances. They are very much part of the broader regional movement that has found in this mechanism a way to protect its water and environment and to decide directly on the issues that affect their lives. One of the most important events in the anti-mining struggle in El Salvador was the announcement of the ICSID ruling in favour of the government. The news helped to strengthen the case for a mining ban and re-energised the movement in general. Oceana Gold reacted quickly and launched a ‘Responsible Mining’ campaign with a view to staying on in the country. But the movement made even better use of this crucial political moment to push ahead with the proposed anti-mining law. With slogans like ‘No to metal mining, Yes to Life’ and ‘Water is life, Mining is death’ the church, social organisations and others allies convened a march for 9th March 2017. Thousands of people participated, calling on the authorities to table and pass the mining ban law. That day a petition was presented to the legislative assembly with thirty thousand signatures gathered by the church in less than a week. The participation of the church at this stage of the struggle was key according to Pedro Cabezas. Although the archbishop of El Salvador had already taken a position against mining, he now took some really decisive action such as personally presenting a draft mining ban law to the Legislative Assembly. All of this “was the catalyst that galvanised all political sectors and all of the social organizations that ended up mobilising tens of thousand of people,” affirmed Cabezas. The objectives of the anti-mining movement in El Salvador were clear from the beginning: a total rejection of mining. For Pedro Cabezas, this is a really important lesson – that local organisations and international allies were able to unite around one single demand. Based on this demand, narratives were developed highlighting, among other things, the importance of water above gold. This demand then had to be substantiated with a strong evidence base – built in alliance with national and international experts. While research and multiple studies relating to the unviability of mining in the country were carried out, there was also the task of confronting and dismantling a series of myths created by the company around development, job-creation, foreign investment, responsible mining etc. Achieving a single common objective is never easy, precisely because of the myths sold around mining that can result in community support for the industry. There is also sometimes a lack of clarity around precise objectives, even though people are moving in the same general direction. This is not helped by the promotion of Responsible Mining or Green Mining by the company – sowing doubt around its actual impacts. In the case of El Salvador, the anti-mining movement and their international allies managed to stay united around the common objective that was the total rejection of metal mining, and garnered broad popular support – as indicated by numerous surveys and by the number of people involved in action on the streets. There is no question that international solidarity was a key element in the Salvadoran anti-mining movement’s victory. As our interviewees have told us, support came from numerous international groups that were involved in El Salvador since the time of the country’s armed conflict, as well as anti-mining groups, and groups working on environmental and water issues. Together they managed to form a broad solidarity network with Salvadoran organisations. One particularly important element of this movement building was the cross-border support of the regional anti-mining movement in the rest of Central America. This ‘South-South’ solidarity was a result of regional organisations united around the same basic need: protecting their water from mining. El Salvador is a particularly water-stressed country and it shares its main water sources with neighbouring countries. Its main water source, the Lempa River, rises in Guatemala, passes through Honduras and only then arrives in El Salvador to eventually flow out into the Pacific Ocean. This is why, according to our interviewees, banning mining in El Salvador does not guarantee the protection of the Lempa River and the other water sources, which is why there is a need to ban mining at regional level. “We have been working on the issue of cross-border mining with Honduras and Guatemala, which are the closest, so that metal mining is also banned in those countries,” says Saul Baños. Some members of social organisations have already talked about establishing a regional Water Treaty as well as other initiatives, to protect water from mining and from other extractive projects. Jen Moore also highlights this lesson. “Learning from the lived experiences of other mining affected communities was key – from brothers and sisters in Honduras and Guatemala for example, and more recently with communities from the Philippines. This exchange between different contexts and experiences is necessary in order to refute the myths and lies that the companies are going to spread” she says. In the opinion of Vidalina Morales “without solidarity, popular struggles and popular victories wouldn’t be possible…For us there is no doubt that this is the only way we can advance in the emancipatory processes of our people,” she concludes. A victory by David against Goliath. This is how Vidalina Morales describes the anti-mining movement’s victory in El Salvador. “We now know that when we organise we are strong”. These are words that no doubt reflect the myriad battles that the movement has had to face over almost two decades to attain their victory. Over all of that time the organizations were able to focus their energies simultaneously on both the national and international struggles – always aware that they must go hand in hand. The struggle to dismantle corporate power internationally and the struggles on the ground are the same struggle. The communities in El Salvador faced the multiple intervention strategies of these multinational corporations year after year and responded with creative resistance strategies in alliance with international organizations. Their efforts have allowed them to block Pacific Rim/Oceana Gold not only in international tribunals, but also with their local territorial struggles, and now with a national law that bans metal mining completely. In the opinion of Pedro Cabezas, it’s important to celebrate and recognise the victories that have been won. Nonetheless, it’s important to remain vigilant -“the companies are unrelenting,” he says. Saul Baños for his part warns that “as long as there is gold in the ground in El Salvador, the companies will always be standing by, they will do everything possible to stay on here. They are unrelenting, systematic and brutal in how they operate, because at the end of the day their shareholders and the company directors don’t care if there is violence. They are always waiting in the wings with new strategies”. These words resonate loudly, particularly when we consider how dependant on extractive industries Latin American countries are, and that the region is now the most dangerous in the world to be an environmental defender – given the high number of (unresolved) murders and the levels of criminalisation of protest, particularly around extractive projects. Unquestionably, multinational corporations and their strategies are major contributors to all of this. The presence of these companies in places like El Salvador cause conflicts from which they benefit directly. Meanwhile there are no accountability mechanisms for communities to demand justice. As we make (very slow) progress with these accountability mechanisms at international level, it is the struggles on the ground that provide the most important lessons regarding how corporations act and what we can do about it – thereby strengthening the hand of other movements across Latin America and the world. [i] For more on the ISDS case and the international solidarity campaign in support of El Salvador, see: El Salvador – When The Seeds Of Resistance Bloom. On 29th March 2017 legislators in El Salvador approved a blanket ban on all metal mining activities in the country – the first country in the world to do so. The historic vote came just six months after a World Bank tribunal ruled in favour of the country’s government in an international investment arbitration case brought by a Canadian mining corporation.